Let me give you the four scariest words I can't pronounce in Arabic: Egypt after Hosni Mubarak. Osama picked the time (9/11), and Bush picked the venue (Iraq), but this fight between radical Islam and globalization's integrating forces was preordained the day Deng Xiaoping set in motion China's economic rise almost three decades ago. You can't rapidly add billions of new capitalists to the global economy and pretend the Islamic Middle East will remain queerly disconnected forever, somehow fire-walled from that borglike assimilation. And so, while resistance may be ultimately futile, it will be bloody as hell in the meantime, with Cairo--not Tehran--likely to become the next big flash point in this Long War. 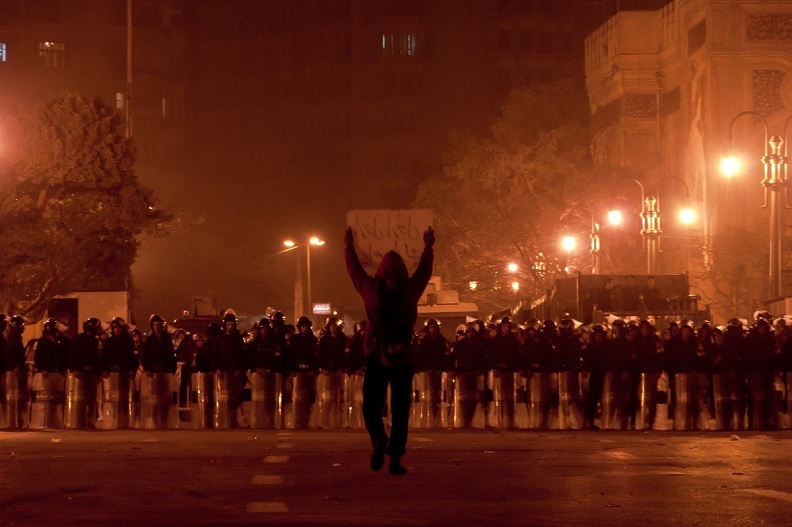 Mubarak's "emergency rule" dictatorship is deep into its third decade, making him one of Egypt's most durable pharaohs. His succession plan is clear: Son Gamal tries to replicate Beijing's model of economic reform, forestalling political reform. Gamal is apparently now in England. For his part, his father appears to have dismissed most of his cabinet and appointed his intelligence chief, Omar Suleiman, as his new vice president. Mubarak also appears to be letting the protests go on, provided protesters do not cross certain "red lines", such as storming government buildings. The question that will have to be answered over the next few days is what model will Mubarak follow? If he follows the Shah model: He'll do just enough damage to keep provoking the rioters as he barley hangs onto power over the next few weeks. The violence will increase, and slowly the military will come to side some faction of the protesters. In this scenario, Mubarak eventually succumbs to mob rule, and is forced into exile with a rough coalition of regime critics forced to step in to fill the vacuum. If he follows the Gorbachev model: Mubarak will quickly accept that there is no way for him to hang onto power in the log term. He'll try to engineer a soft landing for the whole country and a graceful exit for himself. This is the model both that the U.S. probably prefers, and that virtually guarantees Mubarak a Noble Peace Prize. Considering their failure the first time, its sad to see that the ISAF has brought the age old practice of "zippo raids" - pumped up on 50,000 pounds of steroids - to Afghanistan. Its little wonder that these sorts of activities have costs as much as $100 million dollars in damage in the last 6 months. Back at the end of May, I had my own version of a 'Walter Cronkite Moment' as I realized that the war in Afghanistan possibly couldn't be won, and that even it could be, the U.S. was not fighting to win but instead was planning to fail. Today we see that planning to fail has evolved into a strategy of tying to blast our way out. If Obama was planning to keep his 2011 draw down date this would be less odious, but the administration has now shifted to keeping American forces in Afghanistan until at least 2014. Apparently, the developing U.S. strategy is just to wait out the remainder of Karzai's administration and then hope for a reboot, of sorts, in 2014. In retrospect, backing Karzai versus Abdullah was probably a bad move. At this rate, the U.S. will be just wasting time - and burning through $100 billion per year - and watching 500 troops dies, per year - while we run out the clock on Karzai's administration. This is a table showing gun deaths per 100,000 across each U.S. state and comparing it to other factors, including overall violent crime, certain demographic factors, and the Brady Center's "score" of the state's gun control laws, with a higher score meaning more restrictions on a citizen's second amendment rights. This data is this table tells a story. It's the story of a country where cultural habits and beliefs differ significantly from state-to-state and where those cultural habits and beliefs manifest in different ways, including beliefs about the efficaciousness of gun control. It also tells us that gun control is a feel-good measure with little empirical basis. One of the favorite targets of gun control supporters are so-called "assault weapons", which supporters believe are somehow less safe than "non-assault weapons". In reality, a true assault weapon is a selective fire weapon firing a medium range cartridge, such as the AK-47 or M-16. Civilian ownership of selective fire weapons has been strictly controlled since the National Firearms Act of 1934. What nutso gun control supporters call "assault weapons" are actually just self-loading pistols, shotguns and long guns, occasionally cosmetically similar but functionally distinctive from their NFA counterparts. But I digress. Let's just give the wack-jobs the benefit of the doubt for a moment and attempt to test their AWB (assault weapon ban) theories empirically. Hypothesis: If AWBs save lives, then there should be a negative correlation between a state having an AWB and the overall deaths per 100,000 from firearms. Operationalizing the Test: The Brady Campaign provides a scoring system that compares the restrictiveness of each state's guns laws on a total scale from 0 to 100, with 100 being the most restrictive. In the case of AWB, Brady scores states from 0-10, with 10 being the most restrictive. For the purpose of this test I am going to perform a Person's r test to look at the correlation between Brady's AWB score with a given state's death per 100,000. If Brady is correct the safest states should be those with the most restrictive laws and vice versa. Findings: I conducted a regression analysis in Excel to test the covariance between overall deaths per 100k and AWB scores. The overall findings, for all fifty states, was -.39, which suggests a medium negative correlation. The .-39 dosen't tell the whole story. While the number for all fifty states suggests that there is some connection between a state having an AWB and a relatively low number of gun deaths a deeper examination of the numbers reveals a problem. When we examine only the 10 states with the lowest number of guns deaths, the correlation drops to just -.15. If we expand to the 20 states with the lowest number of firearms deaths, we get a correlation of -.25. .25 is considered the very low end of covariance, and .15 is considered an ink blot test, so those numbers tend to indicate little connection between AWBs and guns deaths. Besides, shouldn't states with a higher AWB score be ranked higher? Shouldn't the state with the highest score (California) be ranked #1 (in lowest overall deaths) as opposed to barley cracking the top 20? Furthermore, shouldn't more than 50% of the states in the top 10 have AWBs in place? What this suggests is not that an AWB saves lives (note that the two states with the lowest number of gun deaths score low on Brady's AWB score), but rather that, for whatever reason, some states that happen to have lower gun death rates also have some other factor that makes them more likely to enact an AWB or perhaps support gun control more broadly. But as you can see from the chart above, 50% of the states in the top-10 score 0 on the AWB scale. Except for Hawaii, you'll notice that the 9 of ten states with the lowest gun deaths are also in the Northeast or Upper Mid West, a topic I will return to later. For now, let's turn to a broader question about whether or not their is evidence for gun control in general reducing gun crime. Theory: Gun control saves lives. Hypothesis: Other variables held constant, there should be a negative correlation between the percentage of homicides committed with guns and a state's Brady score. Operationalizing the Test: The chart provides us with two measures of gun homicides, one is the homicide rate per 100k and the other is the overall percentage of homicides committed with firearms. Notice that in many states the rate of gun homicides is less than 60% and in some states its as low as 18% (Hawaii) which suggests that even if all firearms were wished away, many states would still have a relatively high homicide rate in comparison to other OECD countries. Because of this relatively high non-gun homicide rate, I'm going to compare the overall Brady score both to overall homicides and to the percentage of guns used in homicides. If the Brady wackos are correct, gun control might not cut a state's homicide rate, but should at least reduce the percentage of homicides committed by firearms. Findings: There is no link between gun control and a state's homicide rate or rate of homicides committed with firearms. None. Conclusions: There is no evidence gun control, at least gun control as it is defined and measured by the Brady Campaign, reduces either the homicide rate or even the percentage of guns used in crimes. So why do people in some regions of the country seem to think gun control is a good idea? The bottom line is that the evidence supports the position that gun control, at least as defined and measured by the Brady Campaign, has 0 effect on homicides committed with firearms. If measures such as AWBs mattered, we would see the evidence in state-by-state homicide rates. Instead, we see that just as many gun friendly as non-gun friendly states are among the top-10 safest and that the state with the most Brady points is 18th lowest in overall gun deaths.